You can also call, email or Facebook us to book. Hey all you Real Escapees! We have a New Easter “Buy One Get one Free” promotion taking place during Spring Break April 17th – April 20th! For every ticket you buy, the second is free! Must use promo code SPRING_BREAK while booking. 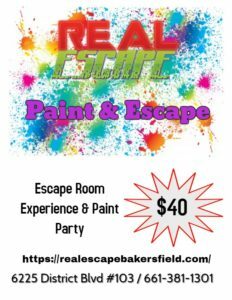 Bookings may be done online or through Real Escape. If you do not want to be joined by others please book the maximum spots. If you will have children under the age of 13 playing, we ask that you have an adult in the room. Everyone must sign a waiver before the game starts. Anyone under 18 must have an adult present to sign the waiver. If you have children under 6 attending they are free. You must contact a member of our staff, if you pay for their ticket there will be no refund! If you or anyone in your group are color blind, night blind, have issues with flashing lights, have trouble reading or use a wheelchair/walker… PLEASE INFORM A MEMBER OF OUR STAFF so we can make sure your experience is enjoyed by everyone in your party. New Event!!! Do an escape room and then paint a beautiful painting. $40 each person for this event. You can also book a private event for this, please contact a member of our staff for details.